Here is the latest "Match The Hatch". As always - look around. I found this guy crawling on my back pack. 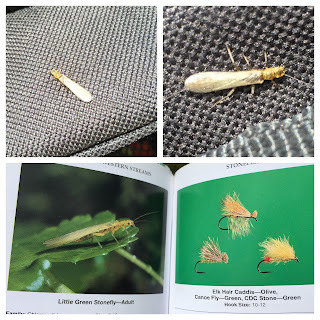 I matched him with my handy dandy "bug" guide book - and he appears to be a Little Green stonefly. 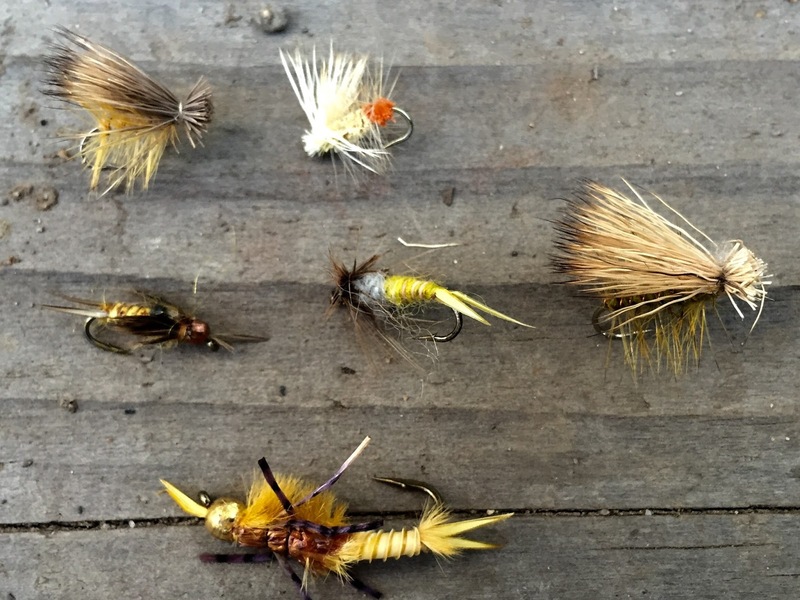 Trout love stoneflies. I really like to fish the dry fly version. 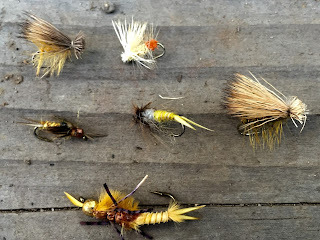 I not only like to fish it solo during a hatch, but I often use it as my top fly with a nymph as my lower or "dropper" fly. 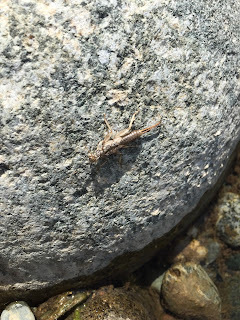 You will find all kinds of stoneflies in the river. They often climb up on rocks. They seem to be present all day long when I fish Sierra rivers. When there is a hatch, it can get crazy with thousands of them filling the sky. Even when there isn't a major hatch you will see one or two in the air. That's why this is one of my "go to" selections. They make great indicators too. 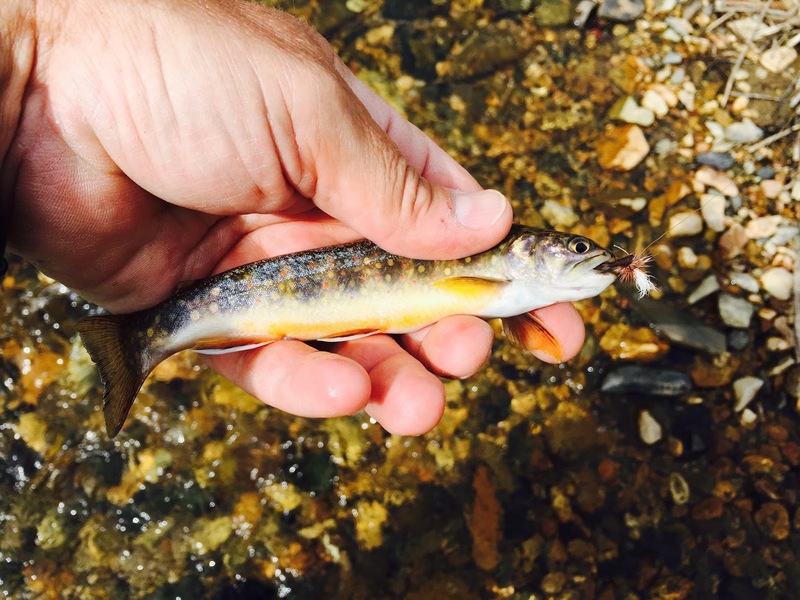 With their "fluffy" easy to see body and yellow color, a nice stone dry fly is great as an indicator. 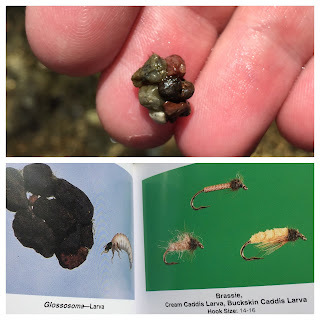 I use "stones" so much that I have a separate box just for stoneflies. I have a variety of sizes, dries, nymphs, emergers, yellow, olive, rubber legged, etc. They can mimic a variety of other bugs too, so at least in the Sierra, I carry a well stocked selection of stones. Here is a new installment of "Match The Hatch". This one is a quick little video we shot along the Yuba River near Downieville, CA. This way you can clearly see actual critters that thrive along the riverbed. 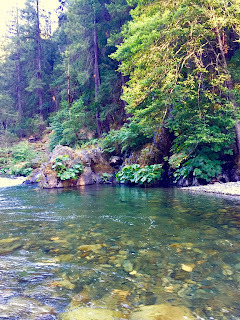 I have previously posted about fishing the South Fork of the Yuba River outside Downieville, CA. I like going there for a number of reasons. Part of the allure is that the area is located in the old gold rush area of California and there is a lot of history and many stories to be found as you drive through Tahoe National Forest and the dozens of small mountain communities and towns that have ties to mining and prospecting. The river is beautiful as well. Its nearly crystal clear and blanketed by lush green forest and ferns and mossy rocks. At roughly three thousand feet in elevation, the area is high enough and cold enough for trout, but make no mistake it can get plenty warm in the summer with temps reaching into the 90s - in which case you will find certain stretches of the river hosting swimmers looking for a cool dip in fresh mountain water. There are many days I want to shed the waders and fishing vest and dunk myself in one of the many deep pools. In fact, this last trip I saw a group of teen boys fly fishing, and they did just that, jumping in for a refreshing dip. There are a lot of bugs in the area. A lot. 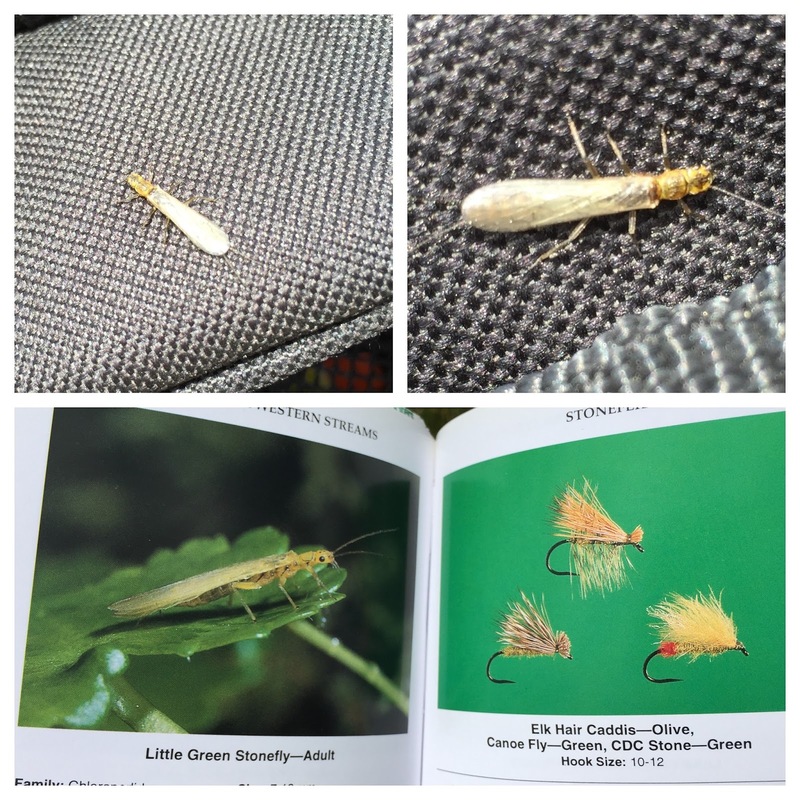 You'll see mayflies, and stoneflies and giant salmon flies. The riverbed is teaming with nymphs and larva. The water is so clear you can see the little cocoons on the rocks and larva crawling on the riverbed. Remember my little pocket guide I mentioned in Match The Hatch 1.0 - let's put it to use again this time. I plucked this little cluster off a rock in about shin deep water. You can see there is a little larva inside, and that's what trout want to eat. I "matched the hatch" - and in a couple of casts I had a fish on. (Sadly I couldn't get a picture. You'll have to trust me). This is the cool thing about fly fishing. You could just walk up to a river and not think much is going on. Just a bunch of rushing water. But there are little trout hidding everywhere. The river is a whole other world of life and creatures and things happening and evolving. You just have to take a moment and look and observe. And when you do that, you not only have a better chance of catching fish, but you forget all about whatever troubles and pressures you face in life, and that's worth the drive, even if you never catch a thing. There is so much to learn when it comes to fly fishing, but I think that's one of the reasons I enjoy it so much. Ya gotta be in tune with what's happening around you. Slowing things down and paying attention to nature's world is not only fascinating, but its what helps me get away from the stress and pace of the working world. Its a totally different pace on the river. And you can't force our hectic pace on nature. Won't work. You have to slow down, look and listen. Besides, if you want a better chance of catching fish, put yourself in a better position. Figure out what the trout want. What's on their dinner plate? You don't have to be a great chef - just a decent entomologist. But if that sounds a little daunting, no worries. While it helps to know your bugs, thankfully there are plenty of resources to assist. I go old school. I tote a pocket sized booklet with me, because I am often in remote locations where there is no cell or internet service, so you can't do a quick Google search. I found a great little book by Jim Schollmeyer called "Hatch Guide for Western Streams". Its full color, with great pictures of the real bug - and then color pictures of the flies to match. It comes in handy. I found this guy (and several of his friends) clinging to blades of grass along the river. I checked my handy-dandy pocket guide - and found a pretty good match. Seems like he might be an American Grannom - and - I can see the fly that might look good to a trout. 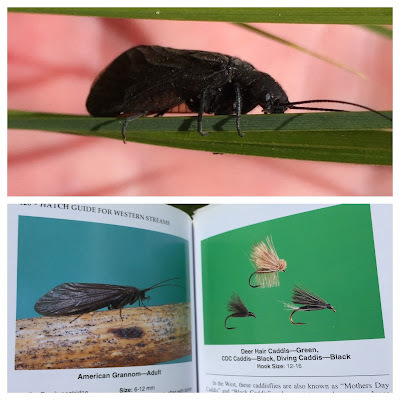 The book shows bugs in various stages of their life, so, if you pick up a rock from the riverbed, flip it over, and see little creatures clinging to it, you'll know what stage of life the bug is in, and what fly to select. You'll get pretty good at it over time, and might not even need a reference guide, but just in case you get stumped, its a very useful tool to carry with you. I'll post a few more of these in the coming weeks. We will take a closer look at the major categories of bugs. 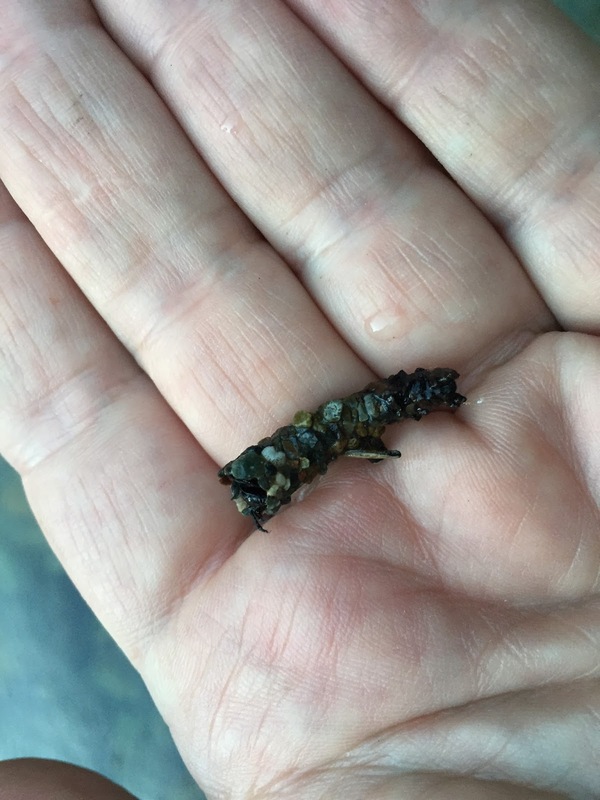 Usually, the two main are caddis and mayflies. The bug in the picture is a caddis. 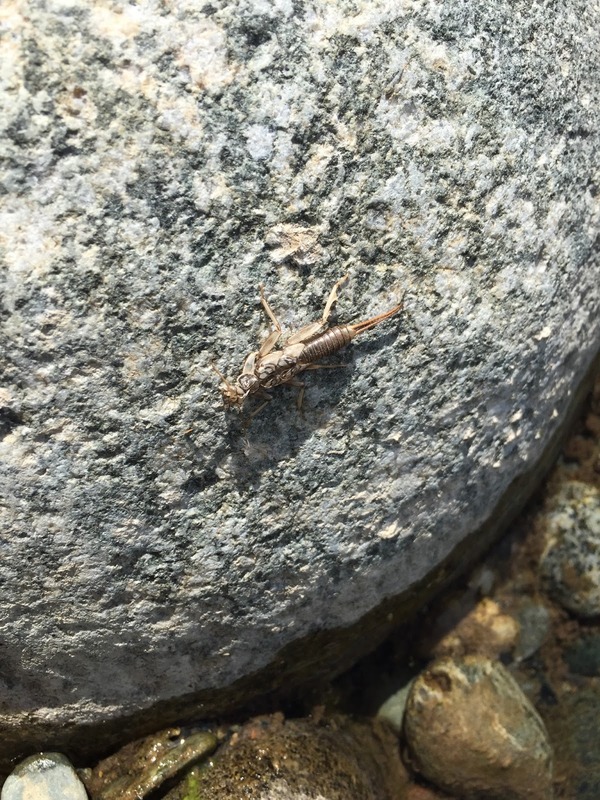 I also like to have a stonefly category, as well as a "terrestrial" group. I lump things like ants and beetles and grasshoppers in the "terrestrial" group. 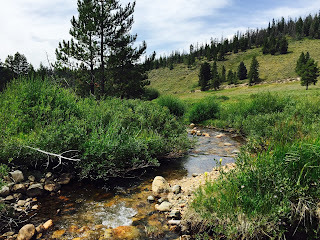 If you want a fun, family friendly, laid back and somewhat rustic get-a-way try the Peaceful Valley Guest Ranch, outside Lyons and Estes Park, Colorado. Some of the top attractions include hiking, visiting nearby Rocky Mountain National park, horseback riding, and of course, fishing. They have a pond on the grounds, right outside most of the rooms. 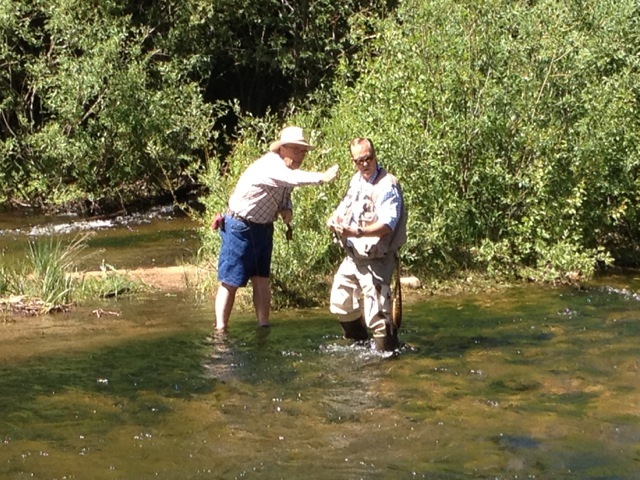 But the middle fork of the Saint Vrain Creek runs though the property and is fun to fish. 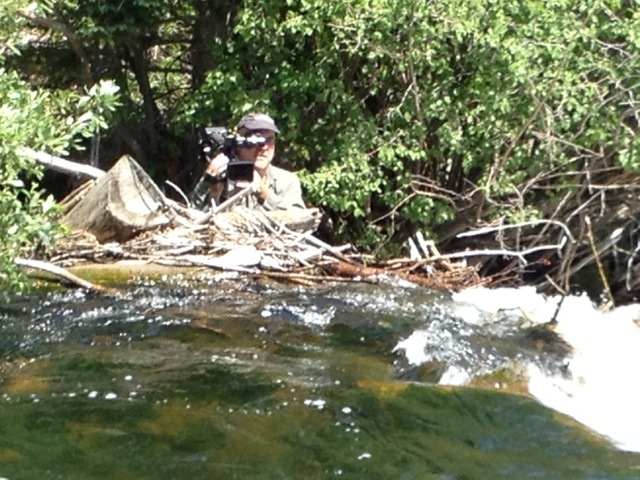 My crew and I were there to shoot for our new TV show - "Fly Fishing West". 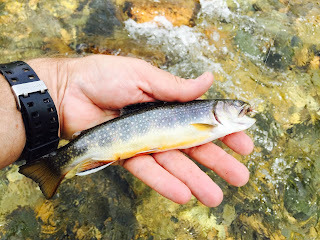 We fished and shot along the St. Vrain - but after the day was done, I enjoyed casting into the trout pond and catching a few, just for fun. Th ranch serves three meals a dal, breakfast, lunch and dinner. Each meal is buffet style, and is served at a set time. But the food is good and you can load your plate as many times as you wish. Our guide Jesse Clark took us to the creek, and was very knowledgeable about the trout, where to fish, and about the flies we needed. He also is a certified Master Casting Instructor, which proved invaluable since we needed casts that would help us navigate casting in thick brush. We usually planned our day during breakfast, then shot until noon. We took a break for lunch, and then went back out for the afternoon. We'd return for dinner, and then a relaxing evening at the pond. I liked that because I could fish for fun, with no pressure about if we would catch fish while the cameras were rolling, or if we had enough footage, etc. The staff was very friendly and accommodating. They even had extra fly rods at the front desk. They have a small workout room, ping pong table, a nice gift shop and plenty of places to just relax. Another day we did a horseback ride to the chapel on the hill above the ranch, but you can ride all the way to the Continental Divide for breath-taking views. This is not a "high end" "fancy" resort or the "Ritz", but you will be cared for and papered in a friendly and wholesome manner. I really enjoyed it. My crew and I were there to work, but it can be the perfect place for a kid friendly, fun, relaxing mountain get-a-way. You can watch a "director's cut" (rough draft) of our morning on the river with Jesse by clicking this link. Enjoy! This a follow up to the beaver pond fly fishing day outside Breckenridge, CO. I had finally got a chance to fly fish a beaver pond. It was a lot of fun. The first cast landed a nice brooke trout. In all, I netted 7 in just a couple of hours. Then - all the action just stopped. I didn't really see a hatch. There were no fish rising. It just stopped. The first thing I did was to scout the nearby creek. The beaver ponds are actually along the North Fork of Swan Creek. As you can see from the photo, its a fairly small and shallow creek. Not much in terms of bigger pools or deep pockets. So, I decided to follow Swan Creek downstream and fish the main creek instead. There is a rock quarry along the creek. At first, I drove upstream, scouting the creek. But much of this area is private property and is posted. So, I went downstream, below and away from the quarry. I found a pullout, and just picked the first hole I saw. I still had the same mayfly on. I was flip casting in a small hole, kind of checking for a hatch, noticing the wind, looking up and down stream, trying to figure out where to go, and I had a hit. Since I wasn't really paying attention, I missed the fish. I saw a promising hole upstream about one hundred yards. I cast upstream, and sure enough. I netted a little brooke. Just around the bend I saw a really nice looking hole. The creek flowed over what looked like a broken beaver dam, and into a pool. I tossed into the headwater - and let the fly drift through. BANG. I saw the strike, hooked the fish, and netted him. He was small, but fun to catch. However, I continued to cast into the hole, and proceeded to catch five fish on the following few casts, and they were much nicer fish. This is where the story takes a tragic turn. Above this hole, which had been very lucrative for me, was an even better hole. And - I saw fish rising in it. As well as I had been doing, this was going to be like shooting fish in a barrel! I was so sure I was going to get great action, I reached once again for my cell phone to roll some video. But - IT WAS GONE!! Where was my phone? I had it in my pocket a moment ago. I looked along the bank and along the rocks. It was nowhere. Then, I turned and spotted it - at the BOTTOM OF THE RIVER! I grabbed it out. It was still on and working. I shot this quick video of that nice hole just to test my phone. After that I quickly and thoroughly dried my phone and turned it off. I was too bummed about my phone to fish the sweet hole. I left the area and went downstream. The rest of the day I had no way of taking pictures and showing the fish I caught. Remember, I had caught seven in the beaver pond. Along the creek I soon had nine more - 16 total. I decided I wanted to make it 20 for the day. I went from hole to hole, looking for a few more fish. But now, other anglers had arrived. I tried to find secluded stretches of creek. In some places the bushes were too thick to even get to the water. Eventually, hole by hole, spot by spot I landed 3 more fish. I had 19. I wanted one more. I was making my way back to the car. Finally I arrived at what would be my last chance at 20. I cast upstream and let it drift, and finally - one little guy hit. I had my 20. I called it a very successful day, and I headed home. My phone? Well, it still works, but it isn't as reliable as it had been. It does some funky stuff these days. I'm in the process of getting a new one. I gotta go go-pro and a headband. You may have heard about the California drought. Winter rain and snow have been below normal for the past couple of years. There has been little snowpack, and hence short spring run-offs. Water tables around the state are far below normal. The state has been tapping into underground water for several years – and there are fears concerning the long term affect of continually drilling deeper. Many wells in rural areas are already dried up. There are harsh Ag water restrictions – and most cities have implemented restrictions – with more expected in the coming months. So, how does this affect fly fishing? 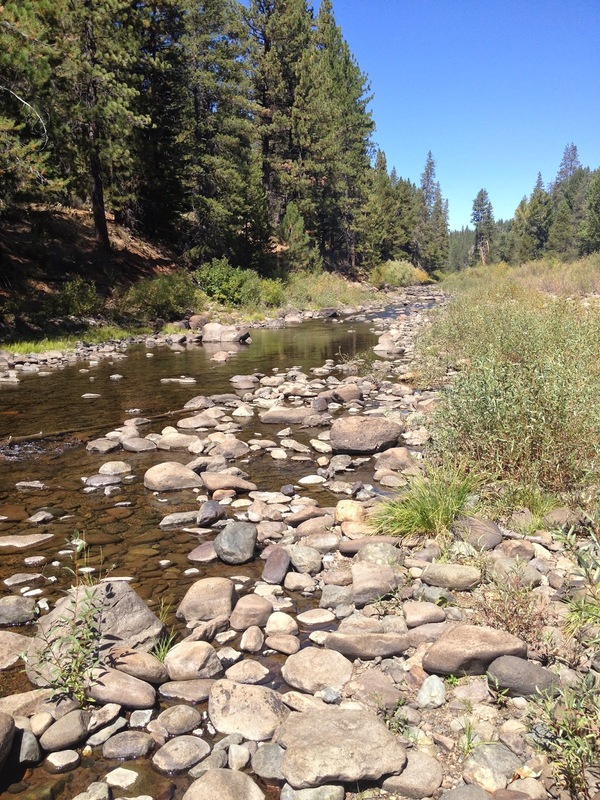 Rivers, streams and creeks often run low by October. But this year – things are drying up to levels not seen in decades, and it is happening earlier this year – by late July and August. I visited a Truckee are fly shop. They post all the latest fishing conditions. Next to each river and stream location they have posted "please do not fish." Its just to harsh on the fish. Here are a few streams I documented in the Tahoe area. Sagehen - This is a small creek anyway. It still has water – but it is low – and with air temperatures still in the 80’s and low 90’s – water temps can be close to 70 degrees. This is almost uninhabitable for fish – and as you can see – there is a ton of moss growing. 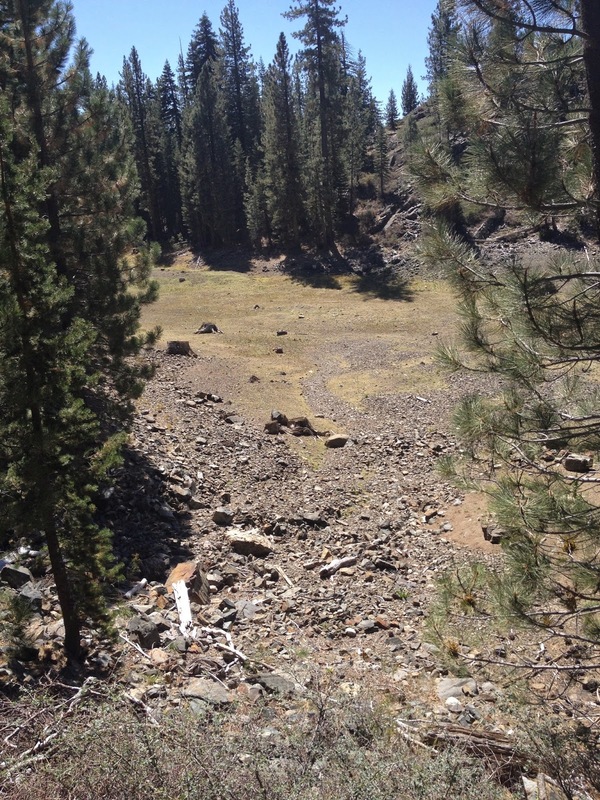 Little Truckee - These pictures come from above Stampede reservoir. As you can see – it is very low. Most of the rocks and boulders you see are usually covered. The water that is visible is only about ankle deep. The story is a bit better below Stampede – mostly because they can still release water. 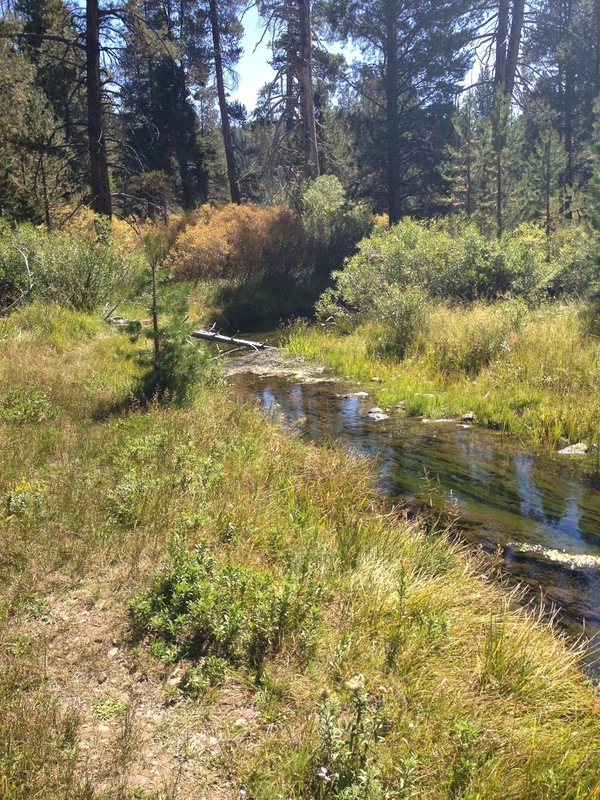 The Little Truckee between Stamped and Boca is a very popular fly fishing area. present. But with low water levels and high temperatures - local fly shops are asking people to either stay away or fish early in the morning, but leave the fish alone after 10am. 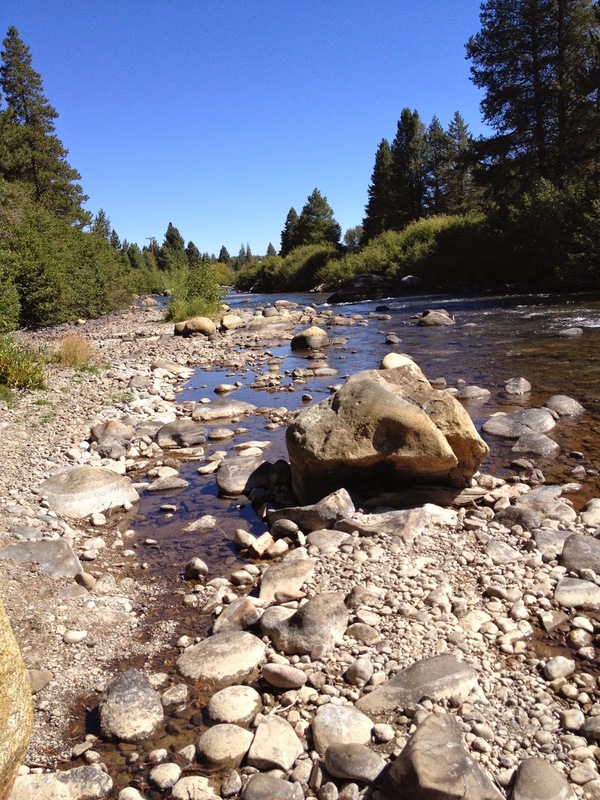 Truckee River - The Truckee River is fed out of Lake Tahoe. The lake is low and not releasing water now. The Truckee can get low this time of year, but it is especially low above and thru the town of Truckee, CA. Below the town are more tributaries (Prosser, Little Truckee, etc) - so flows are usually a tad better around Floriston near the California/ Nevada State line. But again, they are asking fishers to not stress the trout too much. Walker and Carson Rivers – I did not visit the Walker and Carson rivers in person – but after reading on-line – the Walker system is mostly unfishable. They say the fish simply cannot survive the low water and the heat. The Carson still has a few fishable spots, but it is spotty at best. Jackson Meadow Res. – Jackson Meadow Res is one of the better bets this late in the season. In fact, the lakes are your only hope this year. Try Stampede and Bocca as well. As you can see – there is plenty of water in Jackson, but it is low. The picture here is of an inlet and bay that are usually full. Places like this almost look like meadows. In good years, these areas have water. The entire area up to the trees would be under water. Middle Fork of the Yuba River – This stretch of river isn’t too bad. I have seen it so high and raging it is blown out and unfishable. But this year it is accessible and looks decent. It is low, but the levels are ok – and the water coming out of Jackson is ice cold. I saw lots of fish rising and feeding. Milton Reservoir is just down stream. I looked at it, but did not fish it. Looked good overall. The bottom line – California needs a very wet and cold winter. A few “Pineapple” express storms (from Hawaii) can bring a ton of rain – but the storms tend to be warm. Often – it rains on top of mountain snow – creating the infamous “Sierra Cement”. These storms also saturate the ground table too fast – and the water just runs off, back to the ocean - or creates mudslides etc. What the state really needs is a few wet systems mixed with ice cold artic air. These storms mean much better snowpack in the Sierra – which means better storage and a longer run-off the next year. But they way things are right now – ANY rain is much needed.